I have randomly chosen two books that have Musical Theater (no jazz hands) within the span of a week. What are the odds? The Low Down: Margo McKenna is super pumped. The tryouts for the school musical are today, and she knows that she’s going to kill it. After her audition, everyone is so happy with her performance. She knows she will get to play the part of Mrs. Lovett, the female lead in Sweeney Todd. When the results are posted, however, she’s in for a shock: some sophomore that she’s never heard of gets Mrs. Lovett, and she is stuck in the part of Tobias Rigg, a character who only has two songs and is a boy. Rehearsals are a disaster; Vicky, their erstwhile Mrs. Lovett, is horrible. But that’s not the worst part; it seems like Margo is the only person who notices that Vicky can’t sing or deliver her lines in anything other than an expressionless monotone. What’s going on here? Is Margo just jealous? Then things go from horrible to weird. Margo overhears Vicky arguing with Oliver, the school photographer assigned to cover the play. And when Margo finds a silver ring in the girls’ restroom, and Oliver appears the minute she touches it, she finds out that Oliver is a little more than a high school student and a lot older than sixteen. Best Thang ‘Bout It: Yay; a fresh, new paranormal that I haven’t seem since Aladdin. This is sheer genie-ous. (Sorry. Had to.) Having to decide on three things that you want more than anything would be one of the most difficult things, I imagine. The consequences of those actions are probably not thought through, and then it’s too late. Unless you want to un-do with another wish. I love Oliver’s story; how he became a genie and why gives his character a lot of depth. In a previously reviewed book, the characters were also working on a musical, and it seemed to overwhelm the story with minutiae about the musical itself; that doesn’t happen here. Maybe it’s because I am familiar with the story of Sweeney Todd, but I don’t feel like I am on the outside looking in, not only trying to follow a story line, but having to understand the plot of the musical as well. I’m Cranky Because: Margo didn’t float my boat. She was more of a conduit than anything; things happened through her. It felt like the story was pulling her along instead of the other way around. Actually, the only characters that felt three-dimensional were George, the accompanist/indie rocker and Oliver. Even the bad guy was sort-of cartoonish. And the story about her parents? It was more than a little strange. I’ll also mention the book cover and the title…both great, but personally, I don’t think either represent what this novel is really about. Typically, I don’t re-read the synopsis of books before I start the books so that things will surprise me. The cover and the title make the story sound much lighter, like a fun romance, than what’s in the pages. 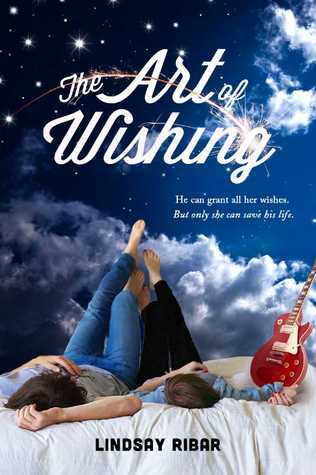 The Art of Wishing by Lindsay Ribar was published today by Dial. A free copy of this book was given to Ink and Page in return for an honest review. Big thanks to NetGalley/the Publisher/the Author.